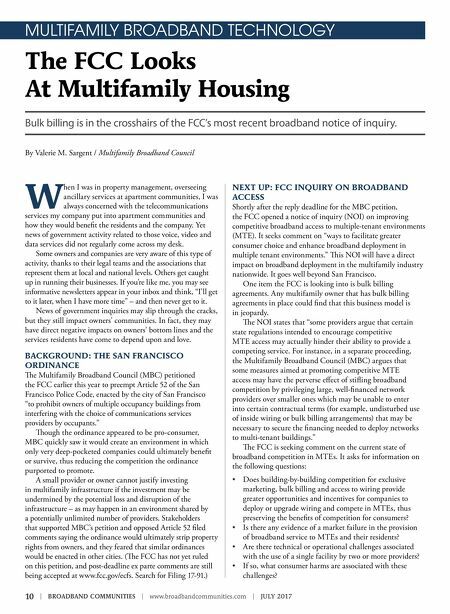 10 | BROADBAND COMMUNITIES | www.broadbandcommunities.com | JULY 2017 MULTIFAMILY BROADBAND TECHNOLOGY The FCC Looks At Multifamily Housing Bulk billing is in the crosshairs of the FCC's most recent broadband notice of inquiry. 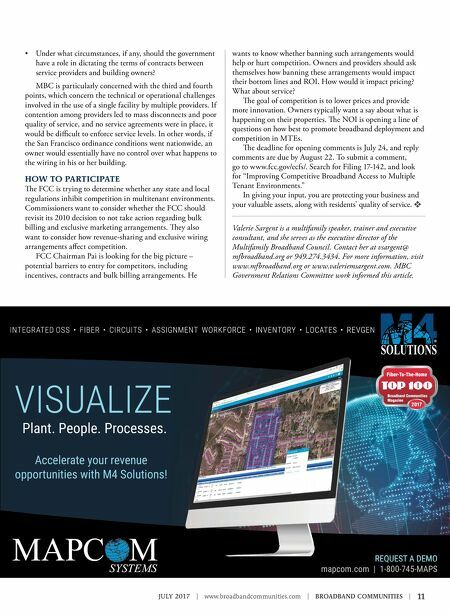 By Valerie M. Sargent / Multifamily Broadband Council W hen I was in property management, overseeing ancillary services at apartment communities, I was always concerned with the telecommunications services my company put into apartment communities and how they would benefit the residents and the company. Yet news of government activity related to those voice, video and data services did not regularly come across my desk. Some owners and companies are very aware of this type of activity, thanks to their legal teams and the associations that represent them at local and national levels. Others get caught up in running their businesses. If you're like me, you may see informative newsletters appear in your inbox and think, "I'll get to it later, when I have more time" – and then never get to it. News of government inquiries may slip through the cracks, but they still impact owners' communities. In fact, they may have direct negative impacts on owners' bottom lines and the services residents have come to depend upon and love. BACKGROUND: THE SAN FRANCISCO ORDINANCE e Multifamily Broadband Council (MBC) petitioned the FCC earlier this year to preempt Article 52 of the San Francisco Police Code, enacted by the city of San Francisco "to prohibit owners of multiple occupancy buildings from interfering with the choice of communications services providers by occupants." ough the ordinance appeared to be pro-consumer, MBC quickly saw it would create an environment in which only very deep-pocketed companies could ultimately benefit or survive, thus reducing the competition the ordinance purported to promote. A small provider or owner cannot justify investing in multifamily infrastructure if the investment may be undermined by the potential loss and disruption of the infrastructure – as may happen in an environment shared by a potentially unlimited number of providers. Stakeholders that supported MBC's petition and opposed Article 52 filed comments saying the ordinance would ultimately strip property rights from owners, and they feared that similar ordinances would be enacted in other cities. (e FCC has not yet ruled on this petition, and post-deadline ex parte comments are still being accepted at www.fcc.gov/ecfs. Search for Filing 17-91.) NEXT UP: FCC INQUIRY ON BROADBAND ACCESS Shortly after the reply deadline for the MBC petition, the FCC opened a notice of inquiry (NOI) on improving competitive broadband access to multiple-tenant environments (MTE). It seeks comment on "ways to facilitate greater consumer choice and enhance broadband deployment in multiple tenant environments." is NOI will have a direct impact on broadband deployment in the multifamily industry nationwide. It goes well beyond San Francisco. One item the FCC is looking into is bulk billing agreements. Any multifamily owner that has bulk billing agreements in place could find that this business model is in jeopardy. e NOI states that "some providers argue that certain state regulations intended to encourage competitive MTE access may actually hinder their ability to provide a competing service. For instance, in a separate proceeding, the Multifamily Broadband Council (MBC) argues that some measures aimed at promoting competitive MTE access may have the perverse effect of stifling broadband competition by privileging large, well-financed network providers over smaller ones which may be unable to enter into certain contractual terms (for example, undisturbed use of inside wiring or bulk billing arrangements) that may be necessary to secure the financing needed to deploy networks to multi-tenant buildings." e FCC is seeking comment on the current state of broadband competition in MTEs. It asks for information on the following questions: • Does building-by-building competition for exclusive marketing, bulk billing and access to wiring provide greater opportunities and incentives for companies to deploy or upgrade wiring and compete in MTEs, thus preserving the benefits of competition for consumers? • Is there any evidence of a market failure in the provision of broadband service to MTEs and their residents? • Are there technical or operational challenges associated with the use of a single facility by two or more providers? • If so, what consumer harms are associated with these challenges?